The Central Indochina Dry Forest ecoregion is rapidly being consumed by large agribusiness concessions, threatening the Pileated Gibbon, Asian Elephant, Fishing Cat and many other unique animals. SMART, a new cutting edge law enforcement monitoring tool, developed by a consortium of conservation organizations including the Wildlife Conservation Society, is now helping strengthen wildlife protection standards in Cambodia. 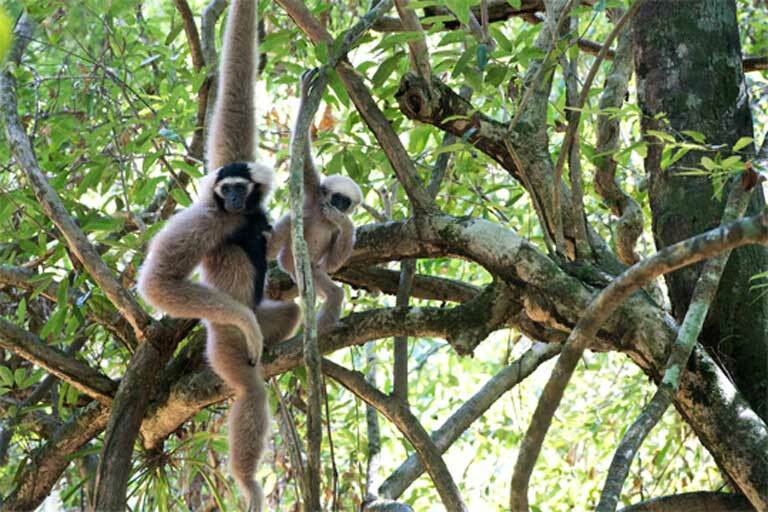 The number of Pileated Gibbon poaching cases have fallen drastically as a result. A Cambodian moratorium on new agricultural concessions, a plan for a major new protected area that will connect prime Pileated Gibbon habitat, and vibrant community engagement in conservation are all brightening the future for this Endangered gibbon. “These forests were formerly home to very large herds of large mammals, [and they] have been compared to the savannas of East Africa,” said Alistair Mould, technical advisor to the WCS Northern Plains project. 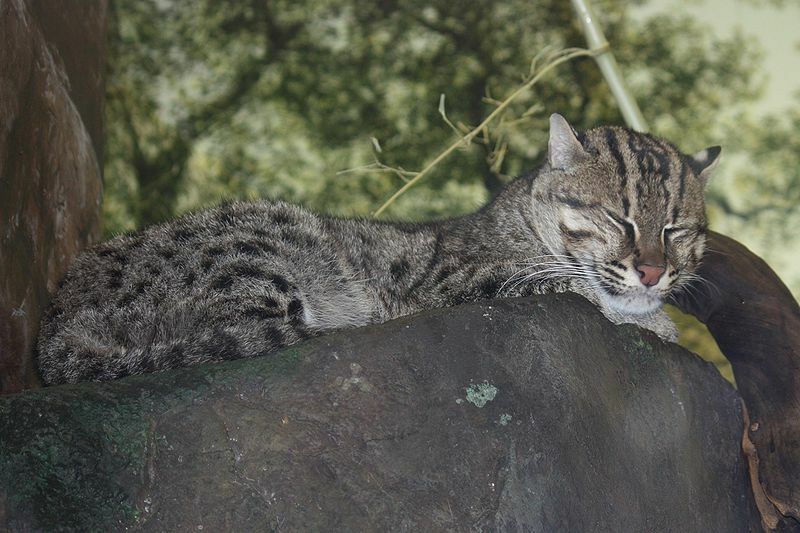 Many of the forest species are on the IUCN red list, including the Asian Elephant (Elephas maximus); the Dhole (Cuon alpinus), a wild dog; the Banteng (Bos javanicus), a wild cattle species; and the Fishing Cat (Prionailurus viverrinus). This is a “unique and critically important” habitat, Mould said. But among them all, the gibbon stands out. “The Pileated Gibbon is a flagship for the conservation of semi-evergreen forest in the Northern Plains,” Prak Munny, WCS Cambodia Deputy Director, stated simply. The gibbons live in small family groups, eat a largely fruit-based diet, and sing melodious duets at dawn and dusk. Their songs, which can travel great distances through the forest, are among the most complicated of any mammal. They sing to help maintain strong bonds between mated pairs, and to defend their territories. Male Pileated Gibbons have black fur with pale hands and eyebrows; females have black chests and faces, with lighter fur elsewhere. Threatened by habitat loss, their good looks have also landed them a place in the pet trade. Pileated Gibbons are classified as Endangered by the IUCN. As their habitat rapidly shrinks, their population has declined by more than 50% over three generations (a mere 45 years). Their range extends into Thailand and Laos, but Cambodia has the largest remaining population, with an estimated 35,000 individuals, making it a hot spot critical to the conservation of the species. These losses are being fuelled by economic land concessions, granted by the Cambodian government as part of a drive to develop industrial agriculture. Almost all these concessions — usually, forest clearing for rubber plantations — fall within the gibbon’s range. Concessions are now even found within protected areas, including Cambodia’s largest, the Kulen Promtep Wildlife Sanctuary, a 402,500 hectare (1,554 square mile) reserve in the Northern Plains. Up to 11 concessions have been granted so far to Cambodian, Malaysian, Korean and Thai companies. These cover more than 60,000 hectares (231 square miles), almost 15% of the reserve’s area, according to data published on Open Development Cambodia, an online hub of publicly-available information concerning social and economic development in the country. The future for economic land concessions is unclear. The government has promoted the conversion of forests to agriculture in recent years, with the nation seeing a significant ratcheting up of deforestation. National figures for the area within concessions range between 1.2 and 2 million hectares (4,633 to 7,722 square miles). The State of the Apes report suggests that rubber plantations alone will quadruple in area by 2050 across all of Southeast Asia. Pileated Gibbons are an endangered species found in Thailand, Laos, and Cambodia. Their habitat is threatened by encroaching industrial agricultural development and hunting. 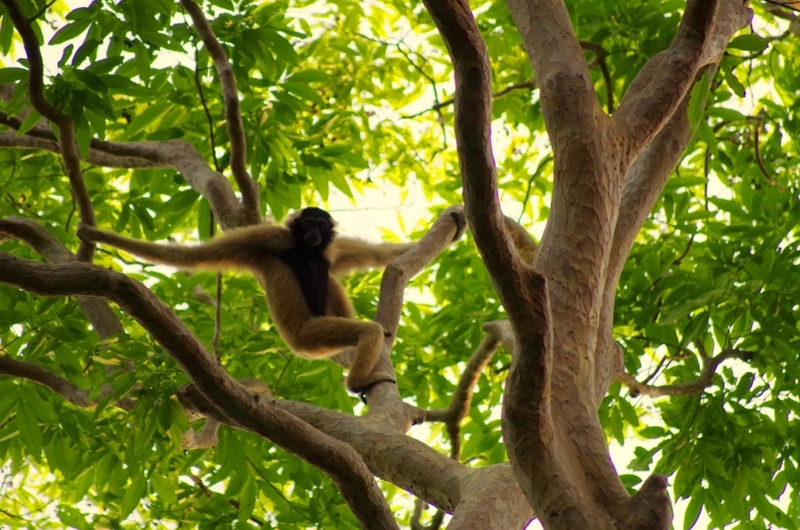 WCS has a long-running gibbon conservation project in Cambodia’s Northern Plains region. Photo courtesy of Julia Dolhem (WCS). The Northern Plains landscape, which encompasses the Kulen Promtep Wildlife Sanctuary and the Preah Vihear Protected Forest, has been a focus of WCS’s conservation activities since 1999. 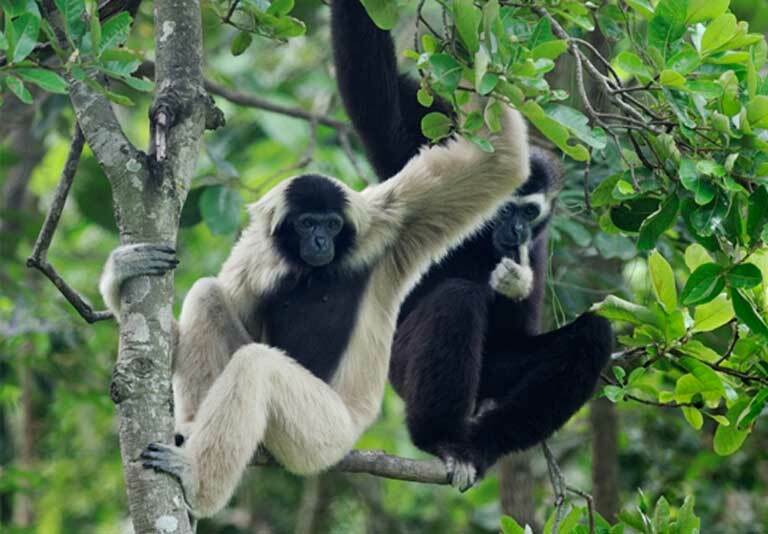 Monitoring and conserving the Pileated Gibbon has been a WCS priority for the past six years, a project that has received support from the US Fish and Wildlife Service. Mould and his Northern Plains team have implemented a three-pronged approach to protecting the gibbons: adopting new technology for more effective monitoring, building the capacity of rangers and law enforcement patrols, and promoting participatory land use planning so communities have a voice in how their land is used. “Working with communities and local government authorities to preserve important semi-evergreen habitat is crucial for the survival of Pileated Gibbons in the Northern Plains,” said Mao Khean, WCS biodiversity monitoring officer. Although economic land concessions generally spell doom for the forests within them, they also attract migrant workers to the area, and this demographic shift has knock-on effects on how surrounding land is used and on how much hunting takes place. Hunting patrols and effective law enforcement are therefore a vital part of any conservation project. “A key achievement of the Northern Plains Pileated Gibbon Project has been improving [the] effectiveness and efficiency of law enforcement and wildlife monitoring patrols,” Mould said. The project has benefited from SMART (Spatial Monitoring And Reporting Tool), a new monitoring approach developed by a consortium of organizations including WCS. In comparison with previous monitoring systems, SMART “is a vastly superior law enforcement monitoring tool,” Mould said. SMART (Spatial Monitoring And Reporting Tool) training course run by WCS. The WCS’s Northern Plains Pileated Gibbon Project uses a combination of technology and community engagement to help conserve the species. SMART is a new approach, combining technology and capacity building to improve law enforcement patrols. Photo courtesy of Alistair Mould (WCS). 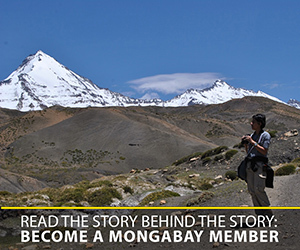 “The SMART approach combines a cutting edge law enforcement monitoring tool with capacity building and a set of protection standards,” Alexa Montefiore, SMART Partnership Program Manager, told Mongabay. “By putting sophisticated mapping, analysis and reporting capabilities in the hands of those working on the frontlines of conservation, we have provided a comprehensive tool for protecting wildlife,” Montefiore explained. 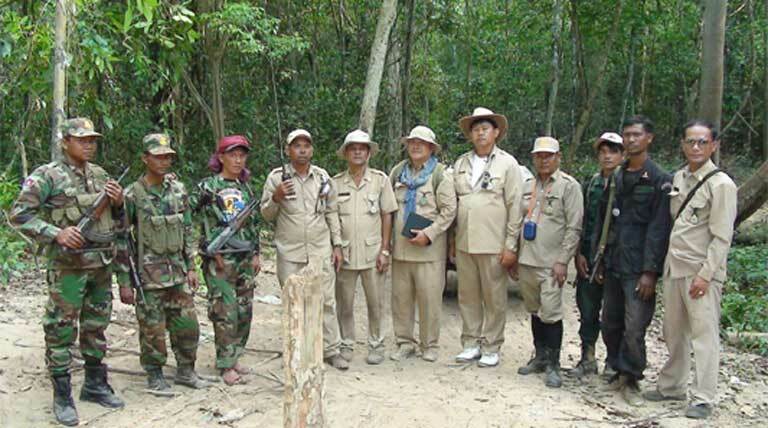 Two law enforcement patrol teams in the Preah Prey Roka Forest, a proposed protected area, in the Northern Plains region. Patrols use SMART to record their observations and to plan effective monitoring activities based on their observations. Photo courtesy of Tan Setha (WCS). SMART, in combination with broader capacity building, has had a real impact in the Northern Plains. Since 2013, protection of important Pileated Gibbon habitat has improved dramatically as the number of patrol staff has nearly doubled. Thirty personnel have conducted 746 patrols, covering 159,461 square kilometers (99,084 square miles). The staff have also received thorough training, including two 9-day law enforcement courses, a National SMART workshop, and two additional SMART refresher field courses. “Incredibly, during the two year period there was only a single hunting record for gibbons,” Mould said. “SMART patrol outputs and targets ensure that forest law enforcement and governance are effective and that agreements with local communities regarding resource exploitation are respected and enforced,” Mould told Mongabay. Patrol teams are highly organized, with each targeting a 5 square kilometer (1.9 square mile) area, especially focusing on key habitat hotspots known to be at risk based on input from past patrols. The patrols are carried out in close coordination with community wildlife rangers, who play a key role in monitoring the most threatened species and key habitats in the landscape. Community members, employed to monitor wildlife, “are essential to the success of this project,” Mould said. But community involvement can have profound impacts beyond data collection and law enforcement, even helping to prevent forest loss by altering community behaviors, leading to local opposition to the clearing of concessions. 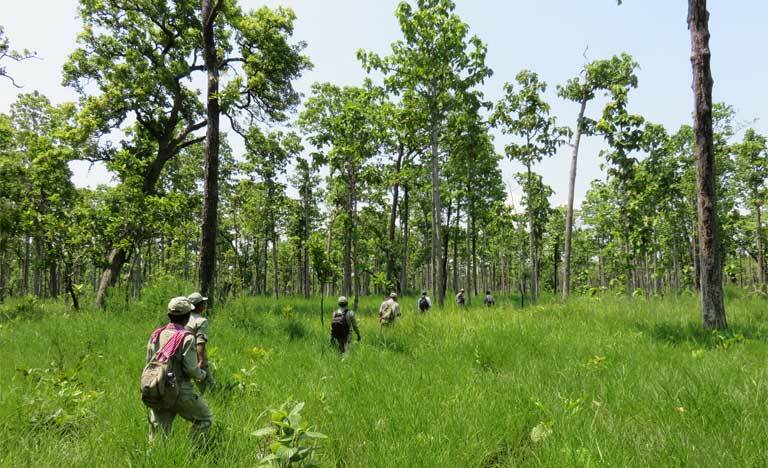 Rangers plan their patrols in Preah Vihear Protected Forest, home to the endangered Pileated Gibbon. Photo courtesy of Alistair Mould (WCS). Community land use planning is a key component of the project, with the establishment of land-use rights a priority for both communities and conservation. “We use the participatory land use planning process to develop community zones around villages to ensure informed local decision-making on land use,” Mould explained. 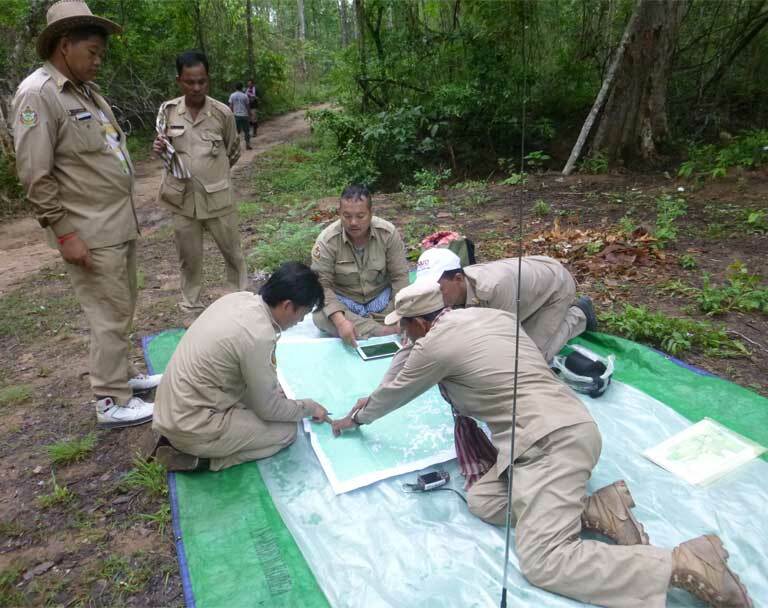 The consultation process within the Kulen Promtep Wildlife Sanctuary has now been completed, and draft maps of the proposed zoning of all villages await ministerial approval, Mould said. However, the Preah Vihear Protected Forest falls under a different ministry’s administration, one that does not yet recognize community zoning, so sustainable use zones there are still being piloted. “This project has been working with the Forestry Administration to develop the official process to allow communities to claim land-use tenure rights and manage community forestry within Preah Vihear Protected Forest,” Mould said. For some species, plantations offer a poor, but still usable, portion of their habitat through which they can travel. Orangutans can move across oil palm plantations, for example, eating the palm fruit as they go from one piece of prime forest habitat to another. Conscientious plantation owners can foster this limited biodiversity by modifying agricultural practices to better meet primate needs and by setting aside areas of high conservation value. A law enforcement patrol in the Northern Plains of Cambodia, one of 746 patrols that have covered 159,461 square kilometers (99,084 square miles). Photo courtesy of Alistair Mould (WCS). That’s why it is crucial that key core gibbon habitats be linked by forest corridors crossing the wider agricultural landscape. The chances of maintaining such connectivity in Cambodia recently received a boost with the proposal of a new protected area. Importantly, this block of forest connects directly to riverine forest in Preah Vihear Protected Forest, where Pileated Gibbon are regularly recorded. The on-going success of the SMART program, Cambodia’s moratorium on economic land concessions, and unfolding plans for the Prey Preah Roka Protected Forest have all worked to transition the outlook for the Pileated Gibbon from deep concern to cautiously hopeful. 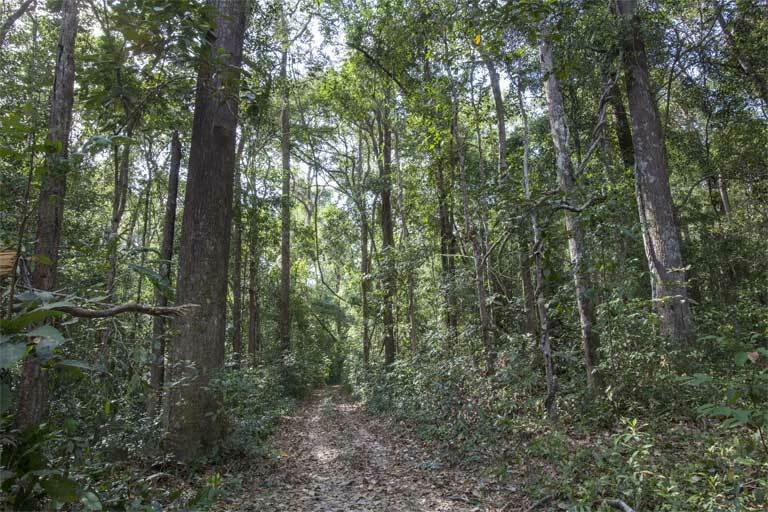 Chendar, a former logging concession, may become a new protected area: Prey Preah Roka Protected Forest. This evergreen forest is an important gibbon habitat, and connects with other areas of high conservation value. Photo courtesy of Eleanor Briggs (WCS).